Singapore’s approach to consumer protection is based on promoting fair trading by businesses, and helping consumers to make informed purchasing decisions. To this end, the Consumers Association of Singapore (CASE) plays a key role in championing consumer education and raising consumer awareness. CASE also helps consumers to resolve disputes with businesses through negotiation and mediation. 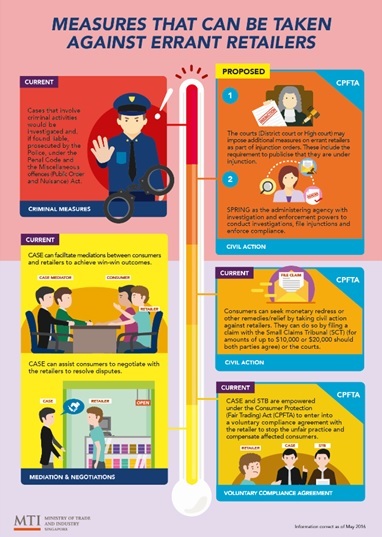 The Consumer Protection (Fair Trading) Act (CPFTA), enacted in 2003, is a key pillar in Singapore’s consumer protection framework. The CPFTA provides for civil actions to stop errant businesses which engage in unfair trading practices. Consumers are able to file claims against businesses which have engaged in unfair trading practices with the Small Claims Tribunal (SCT). The CPFTA also empowers CASE and the Singapore Tourism Board (STB) to enter into voluntary compliance agreements (VCA) with errant businesses to stop them from engaging in unfair practices, and to compensate affected consumers. In 2012, Singapore introduced a “lemon law” under the CPFTA which provides remedies for consumers against defective goods. In 2016, the CPFTA was also amended to strengthen the measures that may be taken against errant retailers who persist in unfair practices. With the latest amendment, SPRING Singapore (SPRING) is now the administering agency for the CPFTA and has investigative and enforcement powers to file timely injunction applications with the courts to require businesses to cease their unfair practices. The courts may also impose additional requirements on errant retailers e.g. requiring an errant retailer to publicise that it is under injunction and notify SPRING of any changes to its entity and/or employment status. This will raise consumers’ awareness of a retailer that is under an injunction order as well as allow SPRING to monitor the retailer’s compliance with the injunction order.